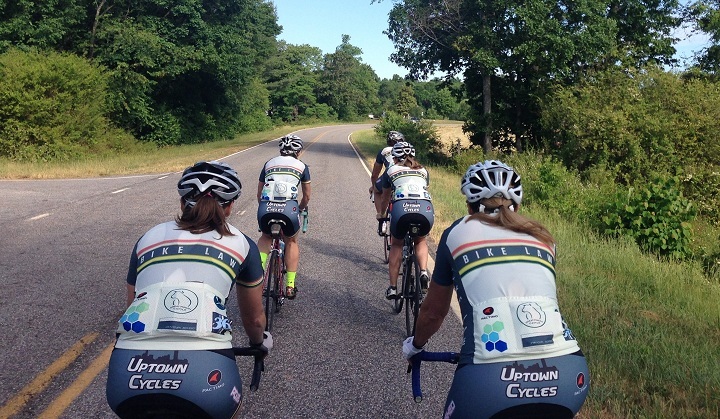 Group rides are popular for camaraderie, efficiency, support and security. Cycling in groups is safer and more enjoyable for everyone when cyclists act cooperatively and predictably. This guide provides an introduction to expectations, skills, laws and best practices for group rides. Bicyclists follow the normal rules of the road for drivers in order to deter collisions with cars, pedestrians, and other cyclists. Riding in close proximity to other cyclists requires additional care. The benefits of proximity include greater efficiency (lower wind resistance, less wasted effort), greater speed, and higher traffic throughput. Close formations require cooperation and trust. Don't follow another cyclist at close distance without their consent. Physical contact with another rider or their bicycle should never be done without the other rider's verbal request. This includes contact with a rider to assist in maintaining a consistent speed. Such contact could be unwanted or misconstrued and could also startle a rider and cause loss of control. Visibility is important. Approach other road users from where they are looking for traffic, and use front and rear lights at night. Changes in speed and position should be gradual and not unexpected when in a group. The most visible and predictable group formation is a double paceline (see Group Formations). Verbalization – Announce your movements when slowing, stopping, overtaking, and changing formation. Signaling – Use hand signals before moving left, right, stopping/slowing, and point out surface hazards and conditions that require moving laterally. Call out unexpected or potentially unseen hazards such as potholes, animals, and cars overtaking under unsafe conditions. Don't call "car back" for every vehicle that overtakes; save warnings for situations that are unsafe or unexpected, such as when other cyclists are encroaching on the left lane, or there is a conflict with oncoming traffic. Surface hazards are hard for following bicyclists to see in a group, so take special care to call and/or point them out and lead followers into a safe path around them. If you call out, use a direction (ex: “Hole Left” or Hole center”) so following cyclists can avoid the hazard. Tell people right away if you experience a mechanical or health problem – this reduces the danger of a collision should you need to slow down or move suddenly, and they can help you with your issue. Don’t use headphones, earbuds, or cell phones while cycling. You need to be able to hear other cyclists and to be focused on your surroundings. The advertised pace is the average over entire ride, not including stops. Expect to go slower uphill, faster downhill and slightly faster on straight, level ground. Estimate your preferred pace based on how strong you will feel at the end of the distance. Understand your physical conditioning and limitations on the day of the ride. If you have not ridden for two months, drop down a level. Same if you are experiencing pain or tiredness even before your ride. Remember that what pace you rode at during the summer does not translate to the winter. Don’t try to start out faster than the advertised pace; save your energy. When a no-drop ride is advertised, some portion of the group will stay with and support slower cyclists even if they cannot maintain the advertised pace. Social rides focus on conversation, sightseeing, and destination visits at a very casual pace. 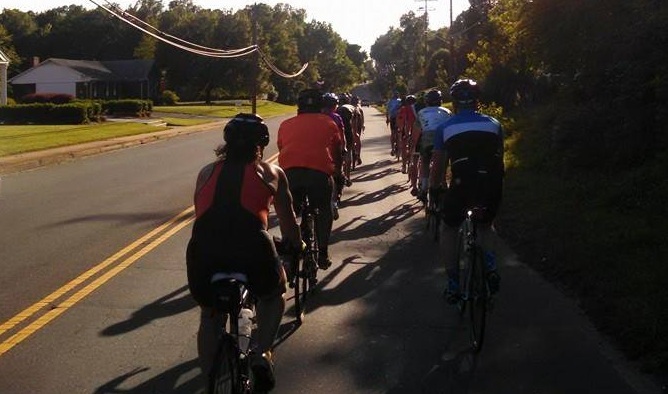 Social rides are a great way for beginners to try riding in a group and to meet new people. 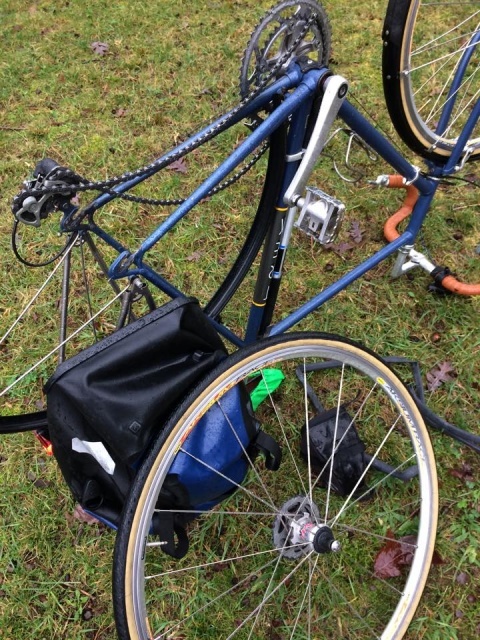 A bike in 100% working order - tires inflated, brakes and drivetrain ready to roll. Social rides can be done on practically any bike; faster rides are best done on a road bike. Your helmet - although infrequent, falls can happen, and a helmet reduces your risk of serious injury. Some form of identification and emergency contact and medical information, e.g. a Road ID, medical alert bracelet, etc. Comfortable clothing for cycling, including bike gloves. Eyewear that protects your eyes from wind, kicked-up debris, and insects. Water or sports drink. Rule of thumb: Plan to drink one bottle per hour of cycling; Refill opportunities will usually be provided for rides over two hours. A high-calorie snack such as an energy bar, especially on longer rides. A credit card, or some cash. A spare tube, tire levers and patch kit. 12 or fewer cyclists form a compact group (no larger than a tractor-trailer) that is fairly easy to pass via the next lane on most roads. Many experienced cyclists find groups of 10-12 to be ideal, providing good efficiency without being too big. For twisty mountain roads lacking sections with long sight distances, a smaller size of 6-8 cyclists is preferable. Communication and leadership are highly effective in small groups. Beginning cyclists can learn through close personal supervision from more experienced cyclists in a consistent, structured group environment. As group size increases, the clear sight distance required to pass safely increases, and motorists have fewer safe opportunities. Motorists may become impatient, and risk-taking by motorists may become more likely. 20 bicyclists riding two abreast is considered to be the upper limit of a contiguous group that can be passed safely on most two lane roads under good sight distances. If a gap in a large group appears, motorists may attempt to pass part of the group, but get trapped in the middle of the group. An undesirable "accordion effect" happens as the front and back of a larger group differ in speed with road conditions. Cyclists must often slow down before they expect the need to slow down, or they struggle to accelerate as the front of the group speeds up after cresting a hill. Coordination of the group becomes more difficult as size increases. Cyclists with different riding habits or skill levels can create conflicts with those who prefer a more consistent and orderly formation. Leadership is weaker and there is less consensus on preferred formation and practices. Large groups can be crowded and stressful for riders with little room for maneuvering. Ride leaders will often break up larger group rides into smaller platoons. Be aware that the different groups may travel at different speeds or cover different distances or routes. Make sure to follow the group that matches your preferences and abilities. Very large groups are common at annual event mass ride starts, and can take advantage of traffic control assistance to “get out of town” in a dense high-throughput configuration. However, these mass starts usually break up shortly thereafter into small groups due to interruptions at intersections and differences in rider ability and speed preference. Faster riders should position themselves at the front during mass starts, and more casual cyclists should start at the rear, in order for the segmentation to happen in an orderly fashion with minimal turbulence. 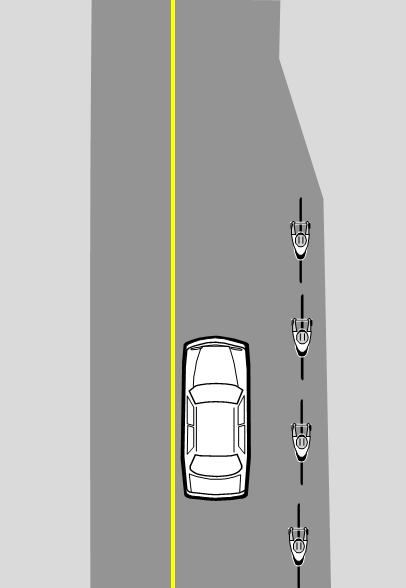 Riding side-by-side within a single marked travel lane increases visibility, deters unsafe same-lane passing by motorists, and makes the group more compact. For more information, see Why Cyclists Ride Two Abreast. 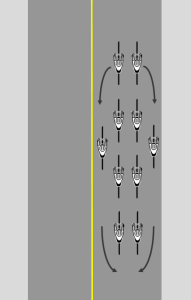 Two abreast (double file) is the preferred, default formation for group cycling. 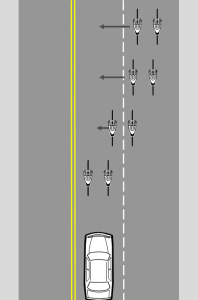 Avoiding more than two abreast facilitates rotation and passing by other bicyclists in the remaining space within the same lane, provides more room for maneuvering and provides shy distance to the centerline, which helps following motorists see what's ahead and avoids unintentional encroachment by bicyclists into the adjacent lane. Riding between lines of bicyclists increases the chance of wheel overlap, which causes crashes when a front wheel touches a back wheel. Staying in a predictable line reduces this risk. 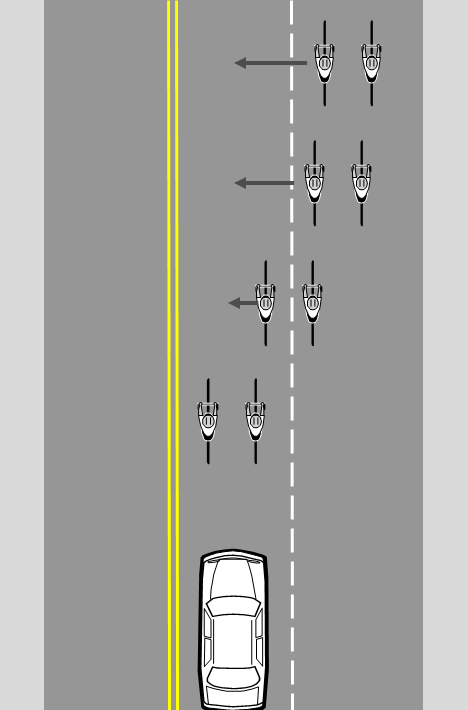 Riding three or more abreast is useful when stopping and restarting at intersections to maximize throughput, if the lane is sufficiently wide. 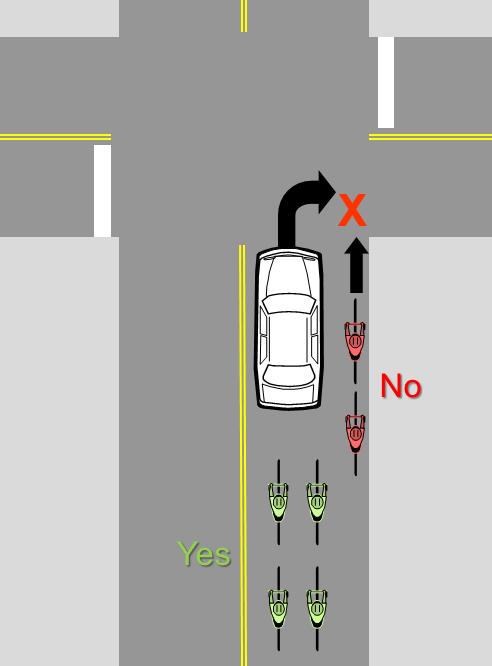 Cyclists should return to no more than two abreast after leaving the intersection. Changing group formation on the road requires time, distance, planning, and cooperation. Don’t expect to make frequent changes in formation. Always look back and yield before moving laterally. Make movements slowly and predictably. Pacelines significantly reduce a group’s wind resistance, allowing travel at higher speeds and longer distances with lower pedaling effort. However, riding in the draft of another bicyclist requires skill and constant attention. Following are some important things to keep in mind about paceline riding. Always maintain safe distance when drafting in a paceline; don’t overlap wheels. If your front wheel overlaps and touches the side of the rear wheel in front of you, you will most likely fall. But if you get too far away, you may have trouble keeping up. The aerodynamic benefit of drafting drops off sharply with distance. At close distance, pedaling effort is reduced by about 30%. At two bike lengths there is no draft benefit. Following at close distance requires skill, focus, trust, cooperation. ½ bike length is a good beginner following distance. Ride closer with experience and trust of other riders. Increase distance when descending hills at high speed or when extra room for maneuvering is warranted. Do not use aerobars when following other cyclists, and do not ride no-handed. Always be ready to maneuver and brake. When drinking from a water bottle, be cautious and give yourself some extra room to maneuver; the back of the line is the safest place to do this. The main speed objectives in paceline riding are to maintain steady level of effort, minimize braking and acceleration, make it easy to stay together, and avoid surprises that can cause collisions. When pulling at the front of a paceline, you affect the entire group. Try to maintain the same pace as the previous leader(s) when they rotate out. Don’t surge ahead (creating a gap) or slow down (forcing everyone to brake). Remember that you’ll be working harder when pulling than when following. If you feel tired and can’t maintain the pace, rotate out and let the next cyclist lead. A speedometer and a mirror can help you monitor your speed and what the rest of the group is doing. When following, pay close attention to the cyclist in front of you, and follow at a steady pace. Don’t let large gap grow and then accelerate to catch up, and don’t brake suddenly. Make subtle decelerations by reducing pedaling effort or by coasting if needed. Proper technique is to continue to pedal, albeit softly, so your momentum stays the same. The lead bicyclist in a paceline works harder than the following bicyclists due to greater wind resistance, so bicyclists take turns riding at the front. Rotation is the process of changing leaders in a paceline. The leader drops to the back of the paceline and the next person in line "pulls" the group for a while. 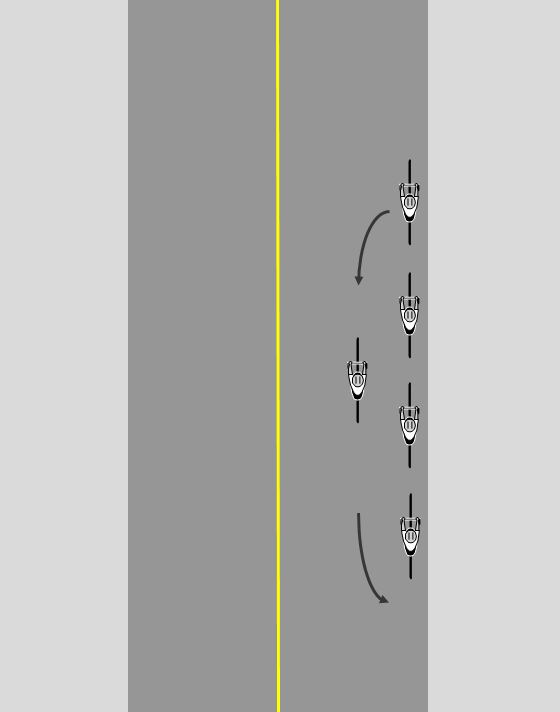 Note that some paceline rotation techniques require more pavement width than others. 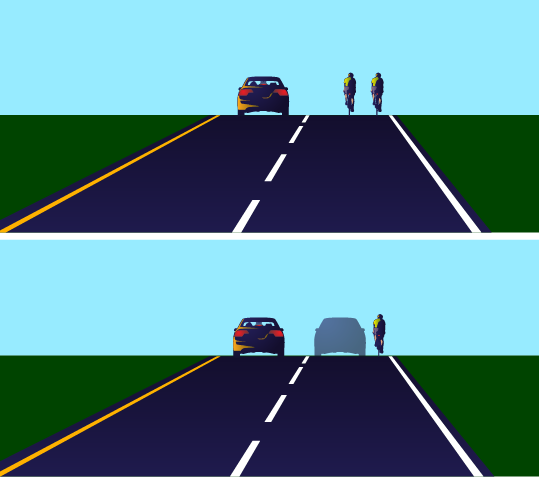 It is important to allow adequate recovery distance from the roadway edge and a few feet of shy distance to traffic in the adjacent lane when selecting and executing a paceline rotation. Failure to do so can result in falls or dangerous interference with overtaking or opposite-direction lane. 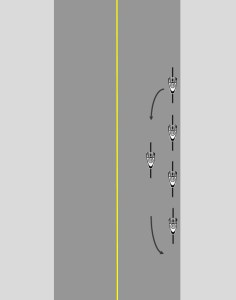 The former leader reduces speed to drop to the back of the line, then accelerates to slip directly behind the last cyclist at the same speed. 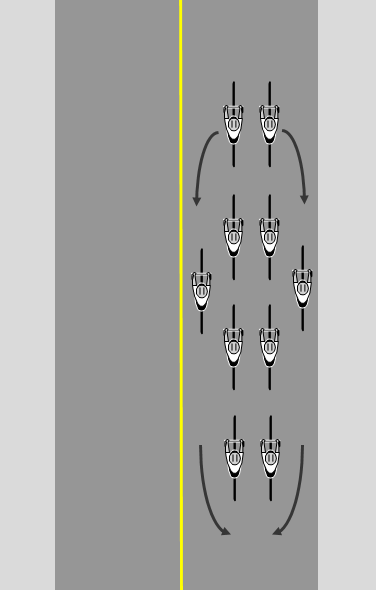 Leftward (counter-clockwise) rotation is a convention that avoids requiring the entire group to shift left to pass the former lead bicyclist. Only the lead cyclist must look back, yield, and shift left when rotating leftward. Leftward rotation is predicated on group understanding and cooperation. When passing any other road user who is not part of the group, the group should pass that operator on the left at a safe distance. Single Sided Rotation – Both leaders rotate to the same side at the same time. This is preferable on most roads, particularly if the lane is narrow. 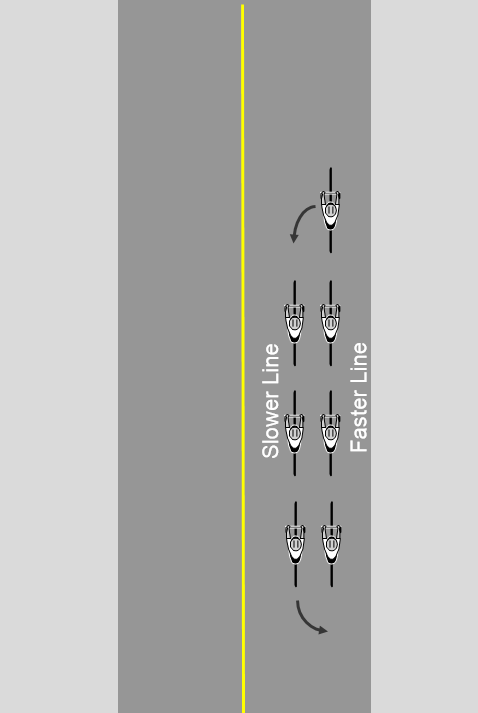 The left side lead cyclist accelerates slightly and moves to their left after indicating their decision to get off the front, as well as checking traffic. That cyclist then drops back in a straight line while staying inside the lane and not crossing the centerline. The right lead cyclist accelerates forward and to the left in front of the left lead cyclists and drops back in the same line. The cyclist in the rear is responsible for dropping back at a faster pace and maintaining a safe distance between themselves and the front cyclist. 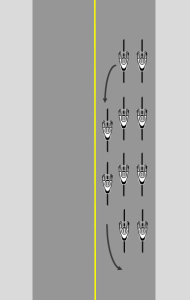 Double Sided Rotation – The left hand cyclist rotates left, and the right hand cyclist rotates right. Rotation of each line can be done independently. 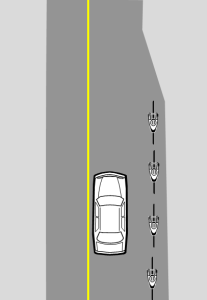 Double sided rotation requires adequate lane width to avoid potential encroachment into the adjacent lane. Continuously Rotating Echelon – This is an advanced technique where the right hand line moves faster than the left hand line, and the right hand leader rotates into to the left hand line immediately after reaching the front. The group never appears more than two cyclists wide. This can also operate in the opposite direction depending on wind and road conditions. When approaching a right turn, use the center of a right turn only lane or merge to the right hand side of a multi-destination lane. Choose and hold a line through the turn – stay in the correct lane, and follow the cyclist in front of you. Merge to the appropriate left lane or left side of the lane when approaching left turns. Plan ahead, look back, and initiate the shift from the back of the group in order to close out overtaking traffic. Yielding to Traffic Ahead – call out “car up” and don’t push the timing of an arriving vehicle; stop and wait earlier than you would by yourself. Watch out for oncoming traffic that may be screened by a stopped vehicle; be cautious if an oncoming vehicle has stopped as a courtesy to let you turn, as other traffic may overtake it. Choose and hold a line through the turn – Aim for the correct half of road that you turn into, and follow the cyclist ahead. Stopping – State law requires each bicyclist to stop and yield effectively like any other driver. There is no explicit requirement to put a foot down. The front cyclist(s) set the example for the rest of the group, for better or worse. If the leading cyclist blows through a stop sign, this puts pressure on the rest of the group to do the same just to keep up, and can encourage dangerous behavior. Stop two abreast (or wider where safe and legal) to control the travel lane and increase throughput. 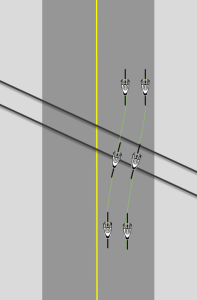 Yielding – Wait until a traffic gap is large enough for all or most of group to proceed. Calling Out Traffic – Always alert others to approaching vehicles. Their vision may be obstructed by other cyclists, or they may be focused on cyclists in front of them. Positioning for Detection – Most demand-actuated traffic signals use inductive loop sensors buried in the pavement. These metal-detecting sensors can detect aluminum or steel rims, non-metallic wheels with metal braking strips, and carbon fiber wheels with a conductive loop of copper wire installed under the rim tape. 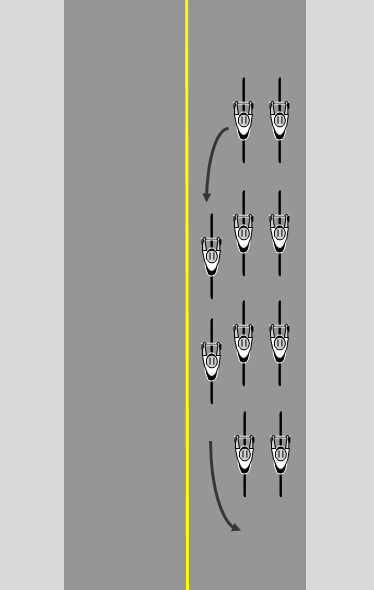 Line up the wheels of multiple bikes in the most sensitive areas over the loop as shown in (a), (b) or (c) below depending on its shape. If Detection Fails – Wait for a large enough gap, get a volunteer to press a pedestrian detector button, or wave a following car to move up and over the sensor loop. Where traffic is stopped in your lane, always get in line with that traffic. Do not filter forward by passing stopped traffic on the right in the same lane or on the shoulder. This unexpected movement is unlawful in North Carolina, increases the risk of a right-hook crash, and is frustrating to motorists who may end up passing the same bicyclists repeatedly. When trying to regroup after an intersection fragments the group, pull off the road to wait for other cyclists to catch up. See Stopping to Rest or Regroup. Common road characteristics can pose special risks to bicyclists riding alone or in groups. Below are some ways to avoid those dangers. Most marked travel lanes are too narrow for safe same-lane passing by a motor vehicle. Motorists will often misjudge the width required to pass safely when they see cyclists riding at the right edge of a narrow lane. This is the most common cause of daylight motorist-overtaking-bicyclist crashes in North Carolina. Controlling a narrow lane by riding two abreast or in its center reduces the risk of overtaking-type crashes by deterring same-lane passing. Drivers can usually pass in the next lane. If other traffic backs up without passing for more than a few minutes, a well-coordinated group can pull off of the roadway at a safe location such as a wide paved shoulder, rest area or public driveway. Unpaved shoulders, sidewalks and private driveways are unsuitable/unsafe locations for group stops. 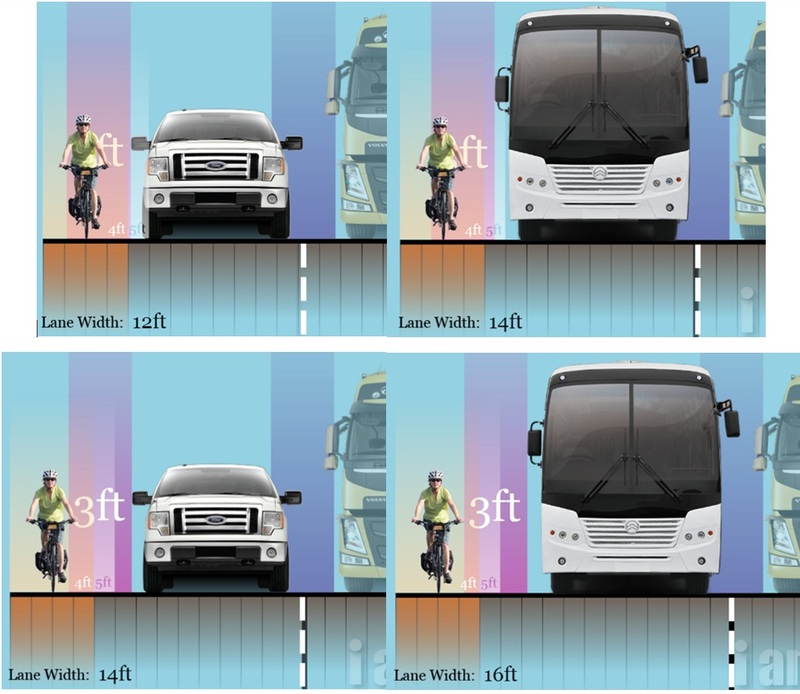 At least 14’ of pavement is required for safe same-lane passing by a car; at least 16’ for passing by a truck or bus. 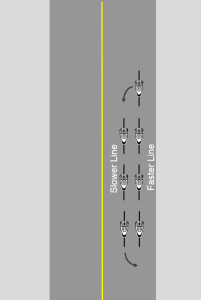 A group may facilitate safe passing in wide lanes by riding single file at the right side of the wide lane. Care must be taken to encourage same-lane passing only with adequate length of wide lane, away from intersections. If conditions at the right edge of the lane vary, operate straight the left portion of the lane as if it is a continuous narrow lane. 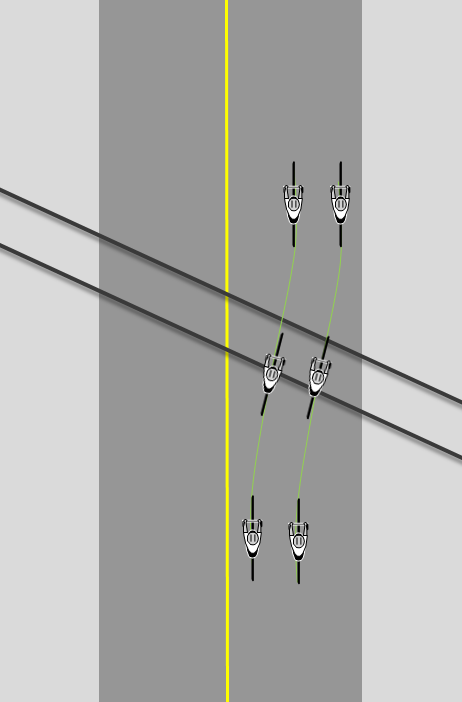 Don’t hug the right edge of a lane as it varies in width; this produces conflicts when the lane narrows. Always stay at least 5 feet from parked cars to avoid being startled or struck when a door opens directly in front of you. 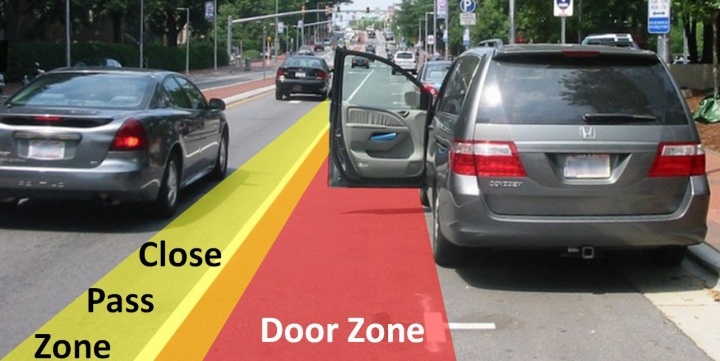 Subtract the 5’ door zone from the lane width when determining the usable lane width. This often means treating the remaining lane width as a narrow lane. Wide paved shoulders and bike lanes vary in quality and surface condition. If wide and clean, they can facilitate passing of the group by motor traffic. Avoid riding on edge pavement that features debris or other hazards that may force the group to make sudden merges into the adjacent lane. 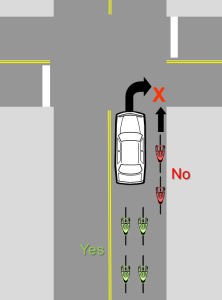 Avoid using right-edge bike lanes and shoulders to pass on the right; this can result in right-hook collisions. It is safer for the group to get in line with the traffic queue. Debris – Stay away from the right edge of the road if it isn't clean. Seams – Beware of the potential for diversion-type falls; stay away from gutter edges, pavement seams and other cracks and height discontinuities that run parallel to your direction of travel. Railroad Tracks – Cross tracks at close to a 90 degree angle. Give other cyclists maneuvering space; communicate and prepare to change lane position and direction of travel as needed. Groups often stop together at rest areas, to regroup, or in response to mechanical problems. Groups may also stop as a courtesy if traffic has backed up for a long time without an opportunity to pass. Stopping as a group requires care to execute safely. Stop your bicycle off the roadway on a shoulder, sidewalk area or public driveway/parking area. If you must stop immediately with no safe paved surface outside the roadway, signal your stop, stop carefully, and then walk your bicycle off of the roadway. Don't try to ride your bike onto a soft shoulder. Be courteous to other drivers and pedestrians who wish to proceed. If stopping at a business, take the opportunity to patronize them. Restaurants and convenience stores are good places to restore your energy, and you’ll be helping the local economy. Take care not to block access to driveways, walkways, parking, or business entrances. Announce your intentions and readiness in advance of restarting. Ensure that there is no other traffic coming. Restart at an easy pace until everyone is together. Below are links to articles on better group bicycling written by bicyclists from North Carolina and beyond.